Garlic, as many of us know is a super-food and ingredient all in it's own. Rich in antioxidants, garlic is also super for maintaining heart health and blood pressure. Garlic also has anti-bacterial as well as antiseptic properties. Providing robust flavor and body to dishes, garlic should be in any home cook's pantry. Always go for fresh garlic for many reasons. First, the taste of fresh garlic is more pronounced and well rounded. Also, buying fresh helps to eliminate additives, preservatives and sodium that is added to ready to eat jars. Buying fresh garlic is also LESS EXPENSIVE than the pre- chopped and peeled versions per capita! Place bulb halves in a piece of heavy duty foil and season lightly. Wrap loosely. Roast for about 25-30 minutes until fragrant and cloves are soft. Let cool enough ton handle and mash with a fork. 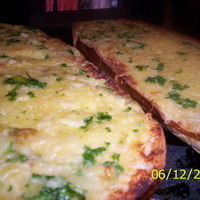 Mix garlic, butter and parsley together in small bowl and spread equal parts on two halves. Place on roasting rack and cook until golden around edges, about 10 minutes. Let cool enough to handle and slice as desired. Great recipe, and easy to prepare. Thanks! This is awesome. I like it! This bread makes for an excellent base for sandwiches. to shave off calories and fats, you may use margarine or other lesser fat spread. Also you can decrease the amount of butter called for in the recipe! Creamy Sausage and Mushroom Dip, Tailgating Gourmet!